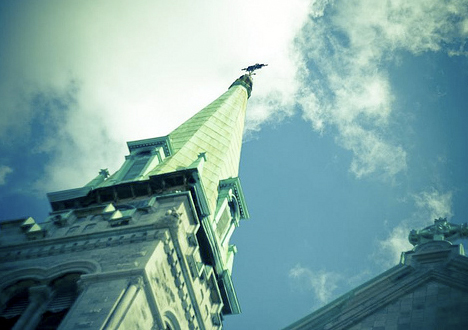 Photo: "Skyward", by Midnight Poutine Flickr pooler ianwoo. The body of a 17 year old Montreal girl was found in a wooded area along the Yamaska river. A 44 years old man, who turned out to be ther boyfriend's father, is in custody. According to Sgt Joyce Kemp, she died a violent death but it "was not through the use of a gun or a knife." And to keep up with the good ol' death and destruction, the highway death toll hits 23 as the construction holidays come to an end. Indeed, that's 5 more, compared to 2007's count of 18 road victims. Oh happy times. Steven Harper, our glorious PM, dared the Liberals to trigger an election after Harper said a carbon tax would "screw everybody across the country," to which Dion challenged the prime minister to an "adult" debate on the proposal. Not only is the weather crappy, but farmers fear crops will be, too. Apparently, crops are just like us, and they don't appreciate too much water. "Weather-wise, there's no such thing as a perfect year," said Christian Overbeek, president of the 10,000-member FÃ©dÃ©ration des producteurs de cultures commerciales du QuÃ©bec. He mentions corn as a particular worry. Fast food nastiness is in the process of being removed from hospital cafeteria menus. Not too long ago, California was banning trans fats from fast food chains and retail baked goods... are we onto something? the reason that this occasion i am reading this impressive educational paragraph here at my house.